Opening up the device reveals a big surprise: It has no hard keyboard. The keyboard area instead has a versatile touch panel that turns into a smartphone-like virtual keyboard, a draw pad, or a digital notepad. The new touch input panel, which has a back-lit virtual keyboard, is a big deal for Lenovo. It will be featured in a new line of 2-and-1s and laptops and is Lenovo's ambitious attempt to break a decades-old habit of using one-dimensional hard keyboards. 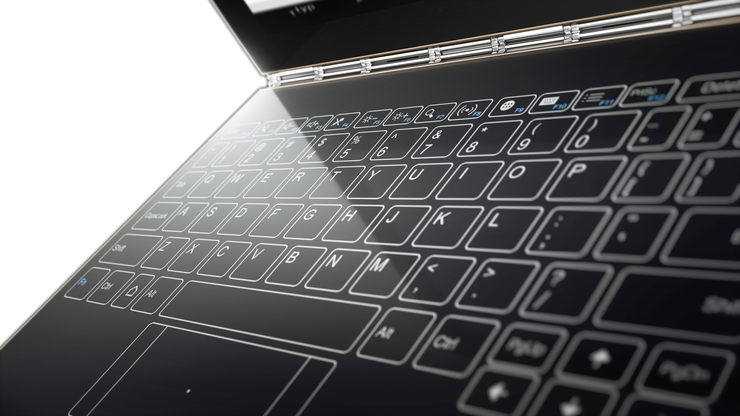 The Yoga Book will be the company's first product with a touch panel replacing a hard keyboard to type, draw, or take notes. Its price will start at US$499, and come with Windows or Android. Lenovo hasn't provided a shipment date for the device. More devices under the Yoga Book brand will follow, and the touch input panel will also go into an upcoming Chromebook, Jeff Meredith, Lenovo’s vice president and general manager of the Android and Chrome Computing Business Group, said in an interview. "You'll probably see products in both the Android and Windows systems. Most likely you'll see a product in the Chrome ecosystem," Meredith said. The Yoga Book has a full HD 10.1-inch touchscreen and can be used as a laptop or tablet. The input panel -- which replaces the keyboard -- won't hurt Yoga Book's estimated 13 hours of battery life, Meredith said. Regular paper can be placed on the input panel to take notes, which will be entered into the device. Lenovo will include an ink pen that also serves as a stylus. It wasn't an easy decision to remove the hard keyboard, which has has been battle-tested in computers for decades. The new input panel took two years to develop and test and will appeal to a young, mobile-first crowd used to virtual keyboards on mobile devices, Meredith said. The virtual keyboard panel could also be popular in Chromebooks, which now support Android apps and are popular in educational environments. Students love to draw and write with a pen, and the input panel will provide that capability, Meredith said. That versatility is not available with hard keyboards, which can restrict a child's creativity. The virtual keyboard panel in Yoga Book has to be turned off to draw or take notes with a stylus. Lenovo, in its two-year study, found that stylus usage on a regular display wanes after a few months, but a separate touch panel to take notes would be appealing to users. Lenovo has included some mobile typing features in Yoga Book. It will include autocorrect and predictive text, which speeds up typing with suggestions. Algorithms will help the device pick up user typing trends over time. Meredith acknowledged there may be some apprehension about the new keyboard, and it may take time for users to get used to typing on a touch panel. The change may be similar to the time needed for BlackBerry owners to get used to virtual keyboards on smartphones. Hard keyboards will still be needed, especially for heavy typists. "If you're banging out spreadsheets, most likely this isn't the right product," Meredith said. The Yoga Book won't immediately have optical character recognition technology for notes taken via stylus on the touch panel. The feature is planned for the future, Meredith said. The Yoga Book will have 4GB memory, 64GB storage, an 8-megapixel rear camera, a 2-megapixel front camera, and a microSD slot for expandable storage. It runs on an Intel Atom processor code-named Cherry Trail. Dual-panel laptops and tablets introduced in the past haven't survived long. Toshiba Libretto W100 and Kno, which shipped in 2010 with full-blown color screens, didn't stick around. But Lenovo has done a significant amount of research and testing and believes the time is right to launch the Yoga Book. "We wanted to make sure the experience hit the mark," Meredith said. "For those in the 20s and teens, there's not much reluctance to a touch-based keyboard."